These walnut urn bases are constructed of medium density fiber- board (mdf) with real walnut wood veneers and the application of a dark walnut stain. 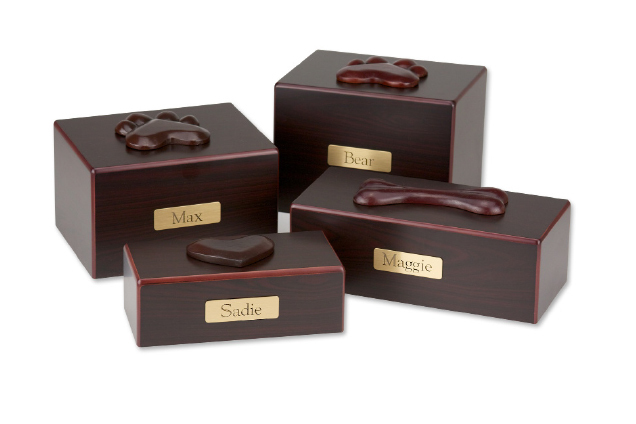 Pet ashes are installed through the removable bottom panel secured to the urn using screws. For engraved name- Plates we recommend 1-2 line engravings, with no more than 25-30 characters per line. Not Available in Small. XLarge 115 cubic inches 69-92 lbs pets 7.75" x 6.0" x 4.625"
Jumbo 145 cubic inches 93-116 lbs pets 7.75" x 6.0" x 5.625"